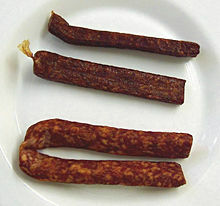 Landjäger (or Landjaeger) is a type of German sausage. The name stands for "hunter's sausage". It is smoked, so it does not need refrigeration. Usually, some of the water has also been taken out (they are dehydrated). This page was last changed on 14 March 2013, at 23:02.